Fenethazine (INN) (brand names Anergen, Contralergial, Ethysine, Etisine, Lisergan, Lysergan; former developmental code names RP-3015, SC-1627, WY-1143), also known as phenethazinum, is a first-generation antihistamine of the phenothiazine group. 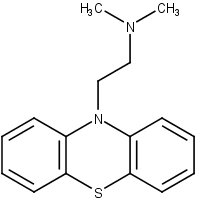 Promethazine, and subsequently chlorpromazine, were derived from fenethazine. Fenethazine, in turn, was derived from phenbenzamine. ↑ J. Elks (14 November 2014). The Dictionary of Drugs: Chemical Data: Chemical Data, Structures and Bibliographies. Springer. pp. 434–. ISBN 978-1-4757-2085-3. ↑ Florencio Zaragoza Dörwald (4 February 2013). Lead Optimization for Medicinal Chemists: Pharmacokinetic Properties of Functional Groups and Organic Compounds. John Wiley & Sons. pp. 301–. ISBN 978-3-527-64565-7. ↑ Walter Sneader (23 June 2005). Drug Discovery: A History. John Wiley & Sons. pp. 404–. ISBN 978-0-471-89979-2.